Please use a box with sufficient packing to prevent breakage during shipment. Please let us know if your water samples contain salt or have been in the proximity of any location using labeled 14C (artificial 14C). Our AMS dating fees for water samples are currently inclusive of δ13C, δ18O and δD measurements; quality assurance reports; calendar calibration when applicable; and 24/7 web access to past results and pending analyses. Stable oxygen-18 and deuterium isotope measurements are also available on a standalone basis, without radiocarbon dating. The δ18O and δD measurements are performed on the water samples in an isotope ratio mass spectrometer (IRMS). The interpretation of δ18O and δD values, as required in hydrological studies, lies with the submitter. 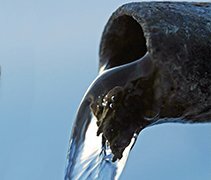 Submittal – For more details about how to collect and submit water samples, please see our Radiocarbon Dating Groundwater page. Please use this online form when submitting samples for δ18O and δD analysis NOT in conjunction with C14 dating. If you have any questions about your sample, please contact the lab. Note – The laboratory also automatically includes stable oxygen isotope measurements for carbonates in the radiocarbon dating service and offers the service on a standalone basis. Beta Analytic employs the isotope equilibrium method to determine δ18O and δD of liquid water samples. This method is ideal for freshwater samples. Marine waters (with salinity (S) of 35 g L-1) can be successfully analyzed given extended equilibration time. Some limitations exist for highly saline natural waters (e.g. S > 100g L-1) such as those in certain salt marshes, hypersaline lakes and lagoons, or hydrothermal brines. These limitations are due to salinity-dependent fractionation factors between CO2 and H2O and will routinely result in accuracy loss on the order of 0.5+ o/oo for δ18O and 5.0+ o/oo for δD. For highest accuracy in results, application of post-analysis correction factors may be needed contingent upon the activity coefficient of the isotope species and the salinity of the original sample.